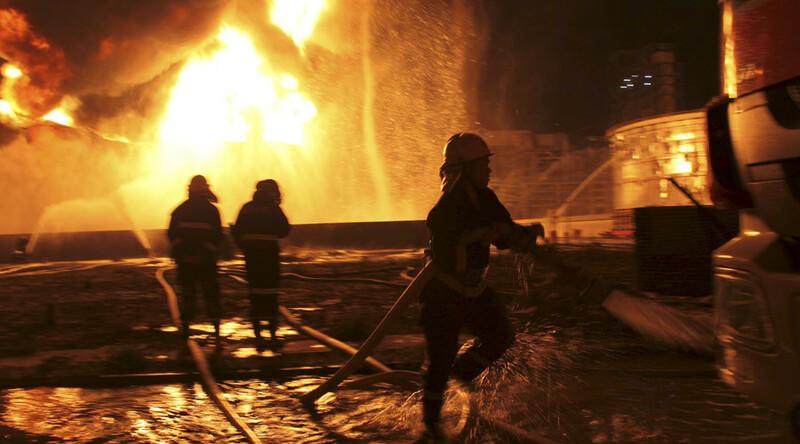 An explosion and fire has occurred at a chemical warehouse in Shandong province in eastern China, shattering windows in nearby houses and injuring at least nine people. The site which contains potentially dangerous chemicals is only one kilometer from a residential area. The explosion happened at 8:40pm local time (12:40pm GMT) at a factory run by Shandong's Runxing Chemical Co., Xinhua reported citing an official Chinese newspaper, People's Daily. At least nine people were injured, according to Chinese media, but no fatalities have been reported. The plant in Shandong province produces around 300,000 tons of adiponitrile, TASS reported. According to local media reports, the toxic colorless liquid releases poisonous gases when it reacts with fire. After the initial blast the facility was engulfed in flames, and some 150 firefighters were deployed to the scene to bring the huge blaze under control. The explosion was so strong that its blast wave was reportedly felt within a two-kilometer (one mile) radius. Windows in nearby houses shattered. Last week, more than a hundred people were killed and some 700 injured in explosions at a warehouse storing hazardous chemicals in Tianjin port. Dozens are still missing and thousands of people were evacuated from the area, their homes having been either destroyed or deemed unsafe to return to. Following the deadly incident in Tianjin in northeastern China, the country's handling of the chemical blasts and the lack of information during such incidents have been criticized by a top UN expert.